The Leo Diamond Review - Are They Visually Brighter [Or Better]? HomeReviewsThe Leo Diamond Review – Are They Really Visually Brighter? The Leo Diamond is one of the world’s most successful diamond brands created by Leo Schachter Diamonds. Unlike the traditional 57 facets round brilliant cut diamond you usually see, the Leo Diamond has a unique, patented 66 facet structure. What grabbed my attention was the claim that it was the first ever diamond to be independently certified as being “visually brighter”. For regular readers of Beyond4Cs.com, you would already know that I always treat marketing claims with great skepticism until proven otherwise. What does the term “visually brighter” mean and what were the kind of tests/measurements/analysis performed to certify its performance? In this review of the Leo Diamond, I am going to dissect details and further investigate whether the Leo cut lives up to its marketing hype. So, how exactly are Leo diamonds measured and certified in order for them to come up with a bold claim of being “visually brighter”? It turns out that the answers lie in a sales tool created by GemEx Systems called the Brilliance Scope ®. Now, I don’t want to bore you with all the technical aspects of the Brilliance Scope. In short, the Brilliance Scope measures a diamond’s performance in a stimulated spot lighting environment using various viewing angles. Speaking from my personal point of view, I consider the BrillianceScope to be an objective and repeatable method to evaluate a diamond’s optical performance. And based on my experience and observations, I generally (but don’t always) agree with the results measured by the Brilliance Scope. However, the caveat you need to be aware of is that the Brilliance Scope only reveals the diamond’s performance under certain conditions (i.e. spot lighting) and not in environments where you’ll probably find yourself in most of the time (i.e. office fluorescent lighting, outdoor day lighting and etc…). 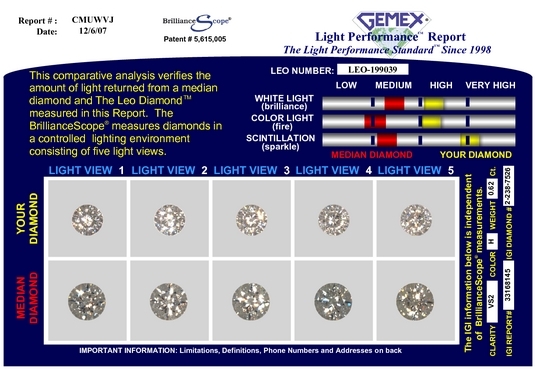 To see an example report of a BrillianceScope analysis performed on a Leo Diamond, you can click this link. In this particular example, the diamond scores a “High” for White Light, “High” for Color Light and a borderline “Very High” for Scintillation. Is The Claim Of Being “Visually Brighter” True? Let’s take a closer look at the marketing campaign by Leo Schachter Diamonds, LLC. On their website, they only state that the Leo Diamond is “The First Diamond Ever Certified To Be Visually Brighter”. That’s true since they were the first company to utilize GemEx for certifying a diamond’s brightness. However, it is also true that this statement isn’t meaningful from a consumer’s perspective. You need to read between the lines carefully. Leo Schachter didn’t claim the Leo Diamond to be the visually “brightest” diamond in the world because it isn’t. Just because they were the first to implement such a system to certify light performance doesn’t make the feat a big deal. Now, I had personally experienced many salespeople from Kay telling me that the Leo Diamond is the “best” in the world based on the GemEx report. They vaguely claim that it’s visually brighter than most other diamonds to convince you into making a purchase. However, have you ever wondered about the kind of diamonds being used in their benchmarks? If I wanted to, here’s how I can play with words and obfuscate consumers in order to market a AGS triple ideal (000) round brilliant cut diamond. Let me tell you for a fact that an AGS 000 will be “visually brighter” than the majority of diamonds based on a Brilliance Scope analysis. Using this AGS 000 diamond (104075088014) as an example, it can easily beat the light return performance of most Leo Diamonds based on its GemEx analysis. It scores “Very High” on the upper boundaries of White Light, Color Light and Scintillation measurements. The point is, I can easily make an AGS 000 sound like a big deal because I’m comparing it against the massive amount of junk out there (e.g. GIA Fair, Good, Very Good cut diamonds). However, the truth is that there’s really nothing special about AGS 000 diamonds and you don’t see many vendors making a big hoo-ha out of these diamonds. If you want to verify the BrillianceScope performance of more AGS 000 round brilliant cut diamonds selected at random, you can simply enter these numbers (104073766007, 104073943001, 104075088007, 104061325005, 104073313007) individually at the GemEx Live Report verification system. The corresponding grading AGS reports can be accessed here: 104073766007, 104073943001, 104075088007, 104061325005 and 104073313007. I encourage you to perform the verification to prove to yourself that Leo Diamonds aren’t the only diamonds that can do well in a BrillianceScope analysis. You can easily find GIA triple excellent or AGS triple ideal diamonds that can trump a Leo Diamond’s performance in the BrillianceScope analysis. You also need to understand that scoring well in a GemEx report doesn’t necessarily mean the diamond is exceptionally well-cut. I figured I would start with the things I like about the Leo Diamond since they are few and relatively mundane. Now, if you compare the Leo Diamond to the standard round brilliant cut, you will realize that they take on a completely different appearance because of their faceting structure. Based on my observations, I feel that Leo Diamond rings tend to have slightly better scintillation than the conventional 57 facets round brilliant cut. Also, the scintillation and patterning of a Leo is usually made up of smaller sized sparkles due to the thinner pavilion main facets they are polished to. There’s nothing wrong per-se with liking such an appearance and ultimately, it boils down to your own personal tastes. In the United States, the Leo Diamond is only sold through certain authorized distributors like Kay and Jared. In UK, their main distributor is Ernest Jones, a large jewelry chain store. Interestingly, in many Asian countries, the Leo Diamond takes on a different brand name and is called the Brilliant Rose. If you ask me which is the nicer name among the two, I would prefer the Brilliant Rose as it sounds more feminine and romantic compared to being called the Leo (Lion) diamond. The other aspect I like about the Leo Diamond is their “Trace Your Leo” feature which adds an element of personal touch to a purchase. If you head over to the official website with the link above, you can find a function that helps customers trace their diamond back to the artisan who cut it. While it doesn’t change the quality of the diamond, I find this feature quite cool since you can find out a little more about the cutter who crafted your diamond. To be honest, there are so many unpleasant things to say about the Leo Diamond that I don’t even know where to begin. First of all, let’s start with the grading report that accompany a Leo Diamond purchase. The majority of Leo Diamonds are graded by an unknown lab called Gemological Science International (GSI) and the International Gemological Institute (IGI). There are some super rare occasions where certain Leo Diamonds have an GIA report accompanying the purchase. My guess is that some private/individual jeweler sent the diamond to GIA to be graded. The corresponding BrillianceScope analysis report can be found at this link. Anyway, it’s a real mess and there’s no consistency in the grading labs used! The fact that different Leo diamonds are sent to different labs for grading is a red flag for consumers to tread carefully. The problem with grading reports from IGI and GSI is that they are not reliable indicators of the diamond’s color and clarity properties. For example, a diamond graded at GSI as F/SI1 could actually be a H/I1 if it was graded by GIA. And if you read my article on the importance of grading reports, you will know that the choice of grading laboratory is never random but is a result of shrewd planning to maximize profits. GSI graded this diamond as SI2. If this same diamond was sent to GIA for grading, I can assure you that it will receive a rating no better than an I1 clarity because of its super obvious inclusions and the huge feather inclusion found under the table. These discrepancies in grading standards result in huge differences in terms of prices and value. The bottomline for you as a consumer, is to only purchase diamonds with grading reports from reliable labs like GIA or AGS if you don’t want to get ripped off. I don’t buy the fluffy marketing pitch of a sales person who says that a diamond performs better because it has more facets. Ultimately, what impacts the light performance of a diamond is the precise placements of individual facets and proportions. When reviewing a diamond brand for its caliber, one of the criteria I look out for is consistency in cut quality. Let me tell you that the Leo Diamonds are cut with huge variations and the production quality control is relatively poor compared to other branded diamonds like Hearts On Fire. This means that there is NO consistency across the board and you will see Leos that look significantly worse than others. Did you notice how the table size can vary so much differently from one diamond to another? Also, another feature I want to point out about the Leo Diamond is that they are typically cut to steeper depths. As a result, you will end up with a significantly smaller looking diamond (lower spread) compared to a standard round brilliant cut which has ideal proportions. In the example above, the 1.48 carat diamond only measures up at 7.13mm * 7.08mm and this is a far cry from the face up size of a properly proportion ideal-cut round diamond. With the excessive premium charged for a Leo Diamond ring, I would expect nothing but the best in terms of the diamond’s finishing (polish/symmetry). Sad to say, that’s not what the Leo Diamond offers you. The craftsmanship standards in the majority of Leo Diamonds are mediocre. This is evident in the “Good” & “Very Good” ratings received for polish and symmetry in the grading report. Call me a cut snob if you like but I expect nothing less than the best considering how much I am overpaying for a diamond. Just ask yourself the following question: would you be willing to pay up to 2 times more for a “branded” diamond only to receive a product with questionable quality? You see, diamonds have a superior hardness and this means they can take on a better polish than any other types of gemstones. Let me tell you that it is relatively easy for a cutter to polish a diamond to attain “Very Good” or “Excellent” polish ratings if they wanted to. The fact that a diamond is left at a “Good” polish state and marked as a completed product reveals a lot about the kind of standards a company has. Compared to the messy and splintery appearance of the Leo Cut (on the right), the traditional round brilliant cut (on the left) is more appealing in terms of its scintillation and contrast patterning. Like its round counterpart, the princess cut version of the Leo is also polished to 66 facets. Once again, the Leo cut has more facets than the generic princess cut diamonds you see in the market. At this point, I want to re-emphasize that the number of facets is NOT an indicator of better optical performance. A generic princess cut diamond can look just as good or even better than the Leo Princess Cut. It is the specific facet placements, angles and proportions which ultimately determine how the diamond interacts with light. In the case of the square cut Leo diamonds, I also found a huge discrepancy in cut quality and inconsistencies in optical performance. Let’s study a couple of Leo princess cuts in more details and do some comparisons to see how they compare against AGS 000 princess cut diamonds from other vendors. This particular diamonds has an excessive depth of 82.0% and a massive table of 80.0%. This means the diamond will face up significantly smaller than another princess cut of similar carat weight. When you see overly deep diamonds or excessively large table facets, those are tell tale signs of cutters trying maximize the yield from a rough diamond at the expense of cut quality. Besides the mediocre proportioning, the diamond is also out of shape too. The edges of the diamond aren’t symmetrical and it also takes up a rectangular-looking appearance which detracts from the usual princess cut look. As if these issues weren’t enough, the price premium on this diamond graded by an “unknown” lab, GSI, will make you cringe. At $8,300, you are paying an insane premium for a stone which doesn’t deserve to command such a high price at all. Now, if you compare it against this 0.928 ct G VS2 A CUT ABOVE® Super Ideal Princess Cut Diamond from Whiteflash.com, you will see stark differences in terms of value and cut quality. The WhiteFlash diamond is top-of-the-line and is accurately graded by AGS for its material properties. Also, this diamond has better color and clarity ratings compared to the Leo diamond and it costs about 45% less! In this comparison of WhiteFlash’s ACA vs the Leo Diamond, the winner is really obvious. Next up, we will take a closer look at this 1.47 Carat I-I1 Leo Princess Diamond from Kay. Circled in red is a huge colored inclusion under the table facet which will be extremely obvious to the naked eye. I’m sorry to say this but if this diamond is ever going to be used in an engagement ring, you better hope that the recipient is blind as a bat and oblivious to unsightly inclusions. Now, let’s compare the diamond to a Brian Gavin signature princess cut that’s a million times better. The differences in quality I’m going to reveal will probably make you think twice about buying a Leo. First of all, look at the HUGE carat size difference between these 2 stones. The Leo diamond has a carat weight of 1.47 while the Brian Gavin stone weighs 1.740 and has a significantly better clarity rating of VS1. And you know what the shocking thing is? The Brian Gavin diamond is still cheaper than the Leo diamond despite its larger size! Because of its unique faceting structure and additional facets, the Leo cut looks completely different from a conventional 57 facets round brilliant cut in its appearance. I had seen a number of Leo diamonds and I personally don’t like the way they look. Now, your tastes may differ from mine and that’s perfectly fine. Most Leo diamonds do have decent optical performance if you compare them to the lousily cut diamonds in the market. To be fair, there are a very small minority of Leo diamonds that are cut to excellent standards. However, because of the issues I highlighted above, I can’t recommend them to my readers in good faith. Given the kind of price premium placed on them and the questionable GSI/IGI certification, you will never know exactly what you are paying for. Using the GEMEX report as a sales tool does help “prove” the Leo diamond’s performance to some extent. However, the truth is that you can easily find well-cut round brilliant diamonds that can perform to equal or even better standards than the Leo cut at significantly lower prices. Online vendors like White Flash and Brian Gavin offer high quality diamonds that are cut to extreme precision and optical performance at significantly lower prices. If sparkle and brilliance are your top priorities, I recommend checking them out. How do you know that brilliant rose is the same as the Leo diamond? Also, how would you compare Hearts on Fire vs the Leo diamond? The Leo diamond is a patented cut. This means that NOBODY can copy the design for commercial purposes. Yet, the schematic diagram for a Brilliant Rose is exactly the same as that of a Leo Diamond. If they aren’t from the same “parent” company or have some business dealings with each other, you can bet that lawsuits would start flying and you will see the Leo Schachter suing “Brilliant Rose” for patent infringement. Hearts on Fire is a company that deals with ideally cut diamonds. I very much prefer the consistency and quality of Hearts on Fire. That said, Hearts of Fire is also a pricey brand that I would avoid unless you have plenty of extra money. I saw a 1 carat leo diamond engagement ring with F SI1 natural princess cut for sale at $8,400. Is that a great deal? For the kind of money paid, I could get a larger sized generic princess cut. So, is the price premium worth it? Who graded the 1 carat Leo diamond engagement ring to be a F color SI1? Is it Gemological Science International (http://www.gemscience.net/) or IGI? The grading report does matter. Anyway, a well-cut 1 carat princess cut diamond from a respectable grading lab will cost around $5,400 http://www.whiteflash.com/loose-diamonds/princess-cut-loose-diamond-3052149.htm. This means you are paying a significant premium for the LEO. now i’m even more confused I am looking for an anniversary ring and thought the leo would shine better. That’s what the salesman wants you to believe in and tells you. Try walking into another store and the salesman will tell you their diamonds “shine” better than the Leo. i just chose a Leo diamond from an independent diamond broker as a replacement for my diamond that cracked and my insurance was replacing (at no cost of course). I didn’t know anything about the Leo diamond, but of the diamonds I looked at to choose from, this was slightly bigger than my original diamond, and clear with no internal flaws that could be detected by myself or husband even under the magnifier (I am not sure who graded it but we did see the paperwork). Much clearer then the other options I was presented with, and even seemed like an upgrade in size and quality from my original. After reading this post, I know that I am still happy with the look of it, it is gorgeous, but wondering about its true worth and quality. I did notice that the top facet is a different shape from my original, hence why I started in on my google- research quest, leading me here. Luckily, I know I didn’t over pay, since it was a replacement diamond. What are your thoughts and what other insight can you give to me? I went to 7 different jewelry stores today, to make things simple I wanted to compare 1ct round on a simple setting. I told the sales person “I don’t want the cheapest diamond in the store and I don’t want the most expensive” and see what they showed me and worked up from there. I went to a Kay’s and to a Belden Jewelers (which are both owned by Sterling Jewelers) The quality of the first diamond they show you is horrible and when you ask for something nicer they quickly move to the Leo diamonds. The first thing I noticed about the Leo diamonds was the price, is astronomical! The second thing I noticed was The Leos seemed to sparkle. I mean just sparkle. There are no yellows, no reds, no blues … There was just no fire to their diamonds. And the third thing I noticed was the quality, I can’t believe they are selling such poor quality stones at those prices. Is hard for me to see the inclusions at naked eye, my eye seems to get distracted and takes me a while to find the inclusions at naked eye. In all the Leo diamonds I saw today there where obviously large inclusions right on the top of the stones and I’m talking about $8,000 dollar stones! Then, they pull out this magnifying glass contraption that has LEDs build in around the magnifying glass that shine away from you so you can see the “shine” of the Leo diamond. … and they shine the light on it. This made me chuckle, because is not like anyone is going to be shining a flashlight on to your girlfriends ring finger. I couldn’t believe how much poor quality is out there, I’m not going to quote quality from the 4 C’s because to me is only some what relevant. If you look at a diamond and it looks good it will looks good to most people but if you look at a diamond and immediately looks bad, is probably going to look bad to other people … I just can’t believe these jewelry stores are asking such a premium for such poor quality stones. Thanks for your review and the time and work you are putting in to keeping people informed. Just bought a 1.4 caret Leo diamond from a UK jewellery store, I’m not impressed. For 8k the pitting and scratches where out of control. I have the paper work and will challenge the workmanship on a later date. I’m not sure what good would that do to you. If you are unhappy about the purchase, try to see if they allow refunds or exchanges if you don’t like your purchase. Also, this article here about buying engagement rings in UK should offer some insights as well. Do let us know how things go. Well, all I can say is that I own a Leo Diamond anniversary ring 1 and a 1/4 cts tcw, and it sparkles like nobody’s business in all types of lighting. I have other diamond jewelry ranging from I I1, H VS2, F VVS2 which are all beautiful with excellent cut grading and I have to say that my Leo ring out sparkles them all and receives the most compliments about the shine and sparkle. I am very happy with my ring and regardless of this article would love another piece of the Leo collection. Leonardo Mastache: You bought a Leo diamond and yet you have all these complaints. I guess my question to you is, why did you buy it then?? When I shop for diamond jewelry it takes me a long time to make my decision because I inspect it and test it, cover it with my hand to see how it shines when shaded, I ask the employee to bring the item out into the mall so I can see it under less of the jewelry store lighting. I request to use their loop so I can see it under magnification my self. I just find it odd that you bought the item and then complain about it here. Why didn’t you just return it?? Leo Diamonds are a mixed bag with little consistency (especially in cut quality) in the branding. There are some better ones and there are many in the lower end of the spectrum. As a practical person (and sensible one as well), it dumbfounds me to see the amount of people who commit the same mistake over and over again. And let me tell you, this is a recurring problem globally I see in consumers and not just isolated to the US or any particular part of the world. Paul: What mistake in consumers are your referring to? I feel the Leo Diamond is beautiful with extreme sparkle. The proof is in the pudding, so if a consumer loves the ring and proudly wears it as I do, then what is the problem? This diamond would not be so popular world wide without a reason for it. Many love it and isn’t that what having a piece of jewelry all about? Let’s face it, unless you purchase a flawless diamond which not many do, diamonds are not an investment as so many jewelers claim they are. So basically it is about have a diamond that you think is beautiful and makes you happy with tons of compliments as a bonus. You should read up more on the website and get a better understanding of how the diamond industry works. I have done plenty of research and unless you own a piece of Elizabeth Taylor’s or Beyonce” collection, you will never get what you paid for if you sell your diamond ring, Never. I disagreed with you, and you seem to have a problem with that. I don’t have a problem with readers disagreeing with what I write. In fact, I welcome it. Let me put this straight; diamonds are terrible investments and was this something I disagreed on? If you actually did your research and read the website, you will know we are actually in agreement. What I have an issue is how some bad actors in the industry utilize unreliable grading reports and appraisal documents to rip consumers off by inflating “value” and blatant misrepresentation. The bottomline is, if anyone wants to buy a diamond, it better be graded by GIA or AGS.